If you have an outdoor space and you don’t know what to do with it, we may have a few answers that will totally blow your mind. These amazing DIY outdoor projects don’t need a whole lot of time or money to set up, and the best part is that your outdoor space will be completely transformed. Here are ten of the best one-hour long DIY outdoor projects to turn your outdoor space into an area that is sure to impress. You don’t need acres of land to create a green space for your living area. If you have a bit of sun exposure and a little area to spare, you are good to go. In fact, why not use some everyday items as the starting point for your indoor vertical garden? If you have an old canvas shoe organizer, that will work perfectly to transform itself into a DIY indoor vertical herb garden. Hang it up in a place that receives some sunlight during the day and plant some of your favorite herbs like oregano, chives, rosemary, and so on. You can even add a rustic charm to your garden by installing a hydroponic watering system. A wooden pallet to create your vertical garden and grow plants like citronella, which works well to eliminate those pesky mosquitoes. Speaking of pests, they can truly ruin an evening spent outdoors, especially those annoying mosquitoes we spoke about. If a vertical citronella garden doesn’t do it for you, why not try making your very own citronella candles to get rid of mosquitoes? You could even take an empty wine bottle and transform it into a pest-busting torch. Of course, a simple way to get rid of bugs of all shapes and sizes is to plug in a table fan. 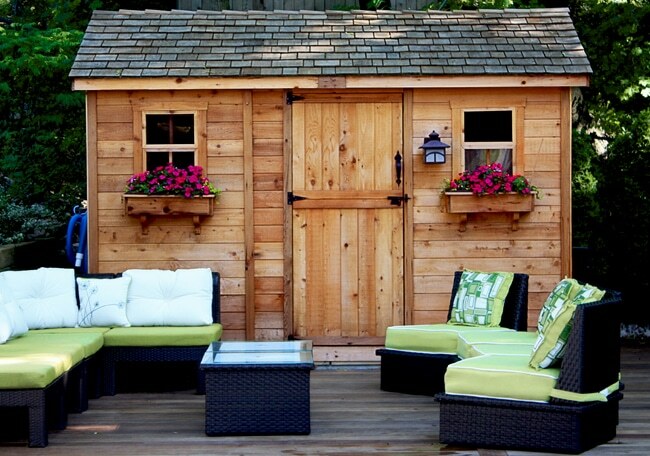 Your outdoor space is where you chill out, unwind, and relax. Maybe you have a pool to splash around, a Jacuzzi to laze around in, or a barbecue pit to cook some delicious treats. Either way, entertaining guests in your outdoor space would be incomplete without sterling music. You can choose to build audio components into an outdoor table or use Plex to stream music to your mobile phone. Don’t forget to hook your phone up to a set of outdoor or portable speakers to amplify the sound. And if that is not unique enough for you, you could even make a set of floating waterproof speakers! Who needs Dolby Digital when you have a backyard? This DIY project will not take more than an hour to do and costs under $10. All you need is a portable projector screen, which you can use both outdoors and indoors and get ready for a movie experience unlike anything you have ever witnessed before! Love Jenga and other such addictive games? Now, you can use your outdoor space to set up life-size versions of some of your favorite games! Is there anything better? You don’t have to make do with just your barbecue pit for an authentic outdoor cooking experience. A DIY outdoor oven can be handy and be used to whip up so many amazing treats. All you need is a metal bucket, a few terracotta pots and a little sand, and you have a reasonably priced tandoor, which you can use to make soft, fluffy flatbreads, and delicious naans. Some cardboard can even be used to make a solar oven which works just as well. If you love meats with that wonderful smoky flavor, you don’t have to spend tons of cash to buy it. You can make it yourself! All you need is a few old flower pots. You could even turn your old grill into a cold smoker. You don’t need to make a large hole in your pocket to be able to afford a fancy outdoor canopy that is aesthetic and weather-resistant. All you need for your DIY outdoor canopy are four poles, a drop cloth and you are ready to go! The drop cloth is weather-proof and protects your guests from any sudden, unexpected weather. Setting up this canopy is quick, easy, and super cheap. Nothing looks more beautiful than flickering amber lights in an outdoor area. Again, mood lighting doesn’t have to come to you at a premium. All you need for DIY mason jar outdoor lights are a few old mason jars, some battery-powered LED garden lights and you’re all set! There’s nothing that draws attention more than a mini fire pit or a set of flaming rock bowls. These are eye-catching pieces that will invigorate pretty much any deck or patio.